This app was created for the Institute for Strong Families Healthy Families Conference in Lubbock Texas. 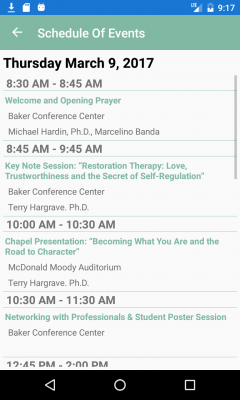 The application is updated each year and offers an easy to browse schedule of events for the two day event as well as information on the keynote speaker. The actual information for the conference schedule is stored in the cloud and is easy to update to account for last minute changes of schedule or venue. This app is an excellent example of the sort of applications that n:n apps can build for you or your organization. A cloud data store makes it easy to update the schedule and speaker information in real time. Future versions can place even more information in the cloud for easy updates. 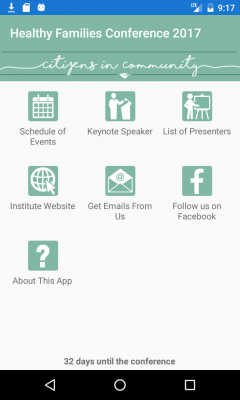 Easily browse the schedule for interesting sessions by both time and presenter.